Golden Ensembles 3, Other CD & Sound Bank from Musicrow. 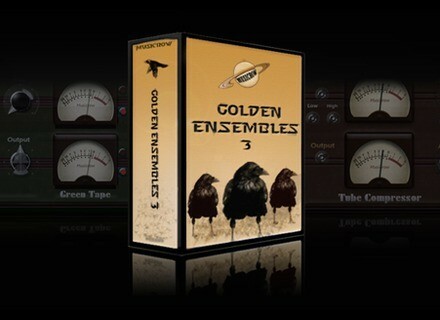 Musicrow has released Golden Ensembles 3, a collection of 44 ensembles for Native Instruments Reaktor 5. Golden Ensembles 3 now includes the new Bass Lab bass machine, the two synths Ebola and Cobra, along with other synthesizers and instruments. In addition, it contains classic processor emulations like Crow Tape Echo and Plate Reverb, and sound design tools such as the new Sound Pilot, Executer, and White FX. Sound Pilot is an audio tool designed to blur the difference between a sound processor and a sound generator. Bass Lab 2 is a dedicated bass synthesizer. Analogica filter offers analog filter emulation, with a warm character. Phase Lab is a special tool for phase correction and comb filtering elimination. Green Master Tape is a new ¼'' tape machine emulator that brings the typical characteristics of analog tapes to your digital studio. 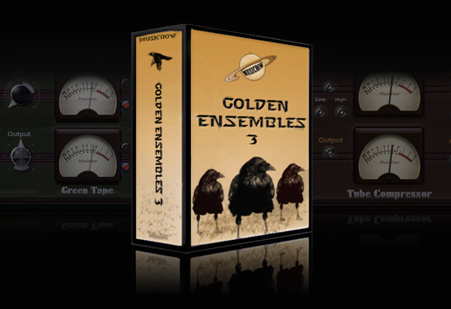 Golden Ensembles 3 costs €169 and available for an introductory price of €99 during April 2012. Users of previous versions can upgrade to Golden Ensembles 3 for €49. Blue Cat Audio Freeware Pack II Blue Cat Audio has released Blue Cat's Freeware Pack II, a redesign of its free audio plug-ins for Mac and PC. TC Electronic Releases LM6 Radar Loudness Meter TC Electronic has announced that its new LM6 Radar Loudness Meter plug-in is now shipping.